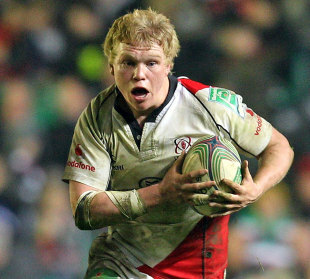 Ulster centre Nevin Spence was killed alongside side his brother and their father in an accident at the family farm in County Down on Saturday. The 22-year old, an Irish Wolfhounds international and a member of the Ulster squad that reached last season's Heineken Cup final, died after falling into a slurry tank. Emergency crews went to the family farm in Drumlough Road outside Hillsborough, Co Down, shortly after 6pm on Saturday following reports that four people had fallen into the slurry pit. Following a lengthy rescue operation it was confirmed that three men had died and a woman, thought to be Spence's sister, was taken to hospital for treatment for the inhalation of fumes. A spokesman for the ambulance service said: "Three were unconscious and NIAS paramedics commenced resuscitation efforts immediately assisted by other ambulance personnel. "One of the four showed initial signs of responding to the efforts of the crews and was transported immediately to the nearby Lagan Valley Hospital, where unfortunately he died a short time later. "Despite the best efforts of all involved the other two men died at the scene. A female was treated at the scene and taken to the Royal Victoria Hospital where she is recovering from the effects of fume inhalation." The player's management company, Cornerflag Management, also issued a statement that said: "It was with great sadness and deep regret that we learned of the sudden and tragic passing of Nevin, his father Noel and brother Graham in an accident on their family farm on Saturday afternoon. Our thoughts and prayers are with the Spence family at this extremely sad time." Spence, who was voted Young Player of the Year by the Irish Rugby Union Players' Association last year, made his last appearance for Ulster's 'A' team, the Ravens, against Munster 'A' on Friday afternoon. Ulster director of rugby David Humphreys emotionally addressed a press conference where he said Spence was "a dream player to work with". Humphreys continued: "He was the epitome of what we were looking for. On days when nobody else wanted to come in and train, he was there leading from the front. All he wanted to do for the remainder of his career was to stay here, win trophies and be successful for Ulster." "It's too early to think about rugby. Too early to think about sport. Over the next few days, weeks, it's about providing support. No doubt it's a mountain to climb, but we're not ready to climb that mountain just yet." Ulster Rugby chief executive Shane Logan added: "I am deeply saddened by this tragic news. Nevin was a wonderful player but also a wonderful person. He was well liked by everyone who knew him and his loss will be deeply felt by his teammates and everyone at Ulster Rugby. The Irish Rugby Union expressed its "deepest condolences" to the Spence family with IRFU president Billy Glynn saying: "This is a terrible tragedy that has struck the Spence family and the thoughts of everybody in Irish Rugby are with them at this time. "Nevin was an outstanding young player which was evident from his progression through the representative ranks and the game has been robbed of a very talented young man. "The rugby community in Ireland is a very close knit one and there has been widespread shock and an outpouring of grief at this news. On behalf of Irish Rugby, I would like to offer our heartfelt support to the family, friends and teammates of Nevin during this difficult time."